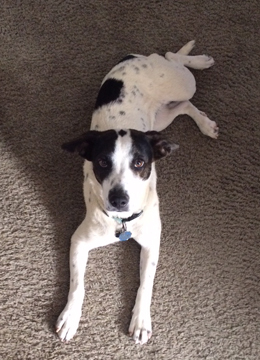 Maggie is an adorable, one-year-old, female, Heeler mix who is looking for her forever home. She loves people and is very cuddly and affectionate. Maggie is spayed, current on her shots and weighs about 30 pounds. She is good with older children, but not sure about cats. She is mostly house trained, just needs some polishing in that area. Maggie needs someone to work on socialization with other dogs with her. She gets frightened when other dogs approach and she growls and becomes defensive. Being an only dog would suit her the best until she learns that other dogs are ok.